There will be a few small changes but nothing too major. 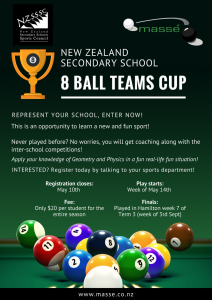 First a name change to the New Zealand Secondary Schools 8 Ball Team Cup. Two competitions will run side by side, one playing Clubs New Zealand rules, the other VNEA rules, with those playing VNEA being eligible for the New Zealand Junior Pool team that will travel to the USA for the junior world champs next year. Both sets of rules can be played on any table. More of an emphasis will be placed on inter-school competition this year prior to the finals. Basically the competition will be run more or less like any other school sport. Already there are some great numbers registering from all areas of the country with new schools coming on board. As a sign of how the game is changing we’ve got one prestigious girls school that has registered players in double digits already with still one week of registration to go! If you want to play in this competition or know of a student that would be keen, contact your high schools sports coordinator or email logan@masse.co.nz. Registration closes Friday May 11.